If I can be a bridge to facilitate someone standing on the cusp of change, I will gladly carry the weight to help them across a huge, deep ravine to the other side. I can’t promise there won’t be scary moments with loose slats and frayed ropes, but I can promise reaching the other side will be worth the worry and fear of getting there. I know, because I’ve stood on the cusp of change many times, and I couldn’t begin to count the people who have been bridges for me. Step by agonizing step, I ran 50 yards. “Good job, Kak,” my brother Jim said. Then I ran a mile. “Good job, Mom,” my daughters said. They didn’t realize they were bridges, but they were. 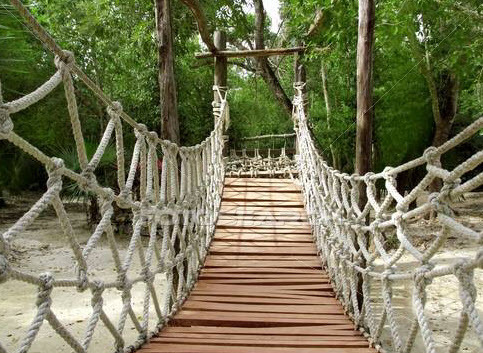 Their confidence help me plant my feet on the first slat of that Bridge of Dreams. The same can be said of the two wonderful critique partners I had during the countless revisions of THE RUBY BROOCH. They were the ropes when others were two frayed to support me. They were the slats when others were too weak to walk on. 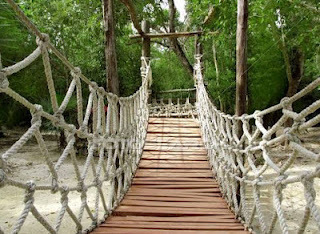 If you never step foot on that bridge, scary as that first step is, how will your dreams ever come true? Step by step, while nothing seemed to change, except my muscles and my brain got tired, everything was suddenly different. In thirteen days, I’ll run thirteen miles, and I’ll release my time travel romance. To get to this point, I’ve crossed more rickety bridges than I can remember. Many of them I had to be coaxed across, but I’ve never given up on my vision of the view from the other side of the Bridge of Dreams. Take that first terrifying step today. Before you know it, everything will be different.